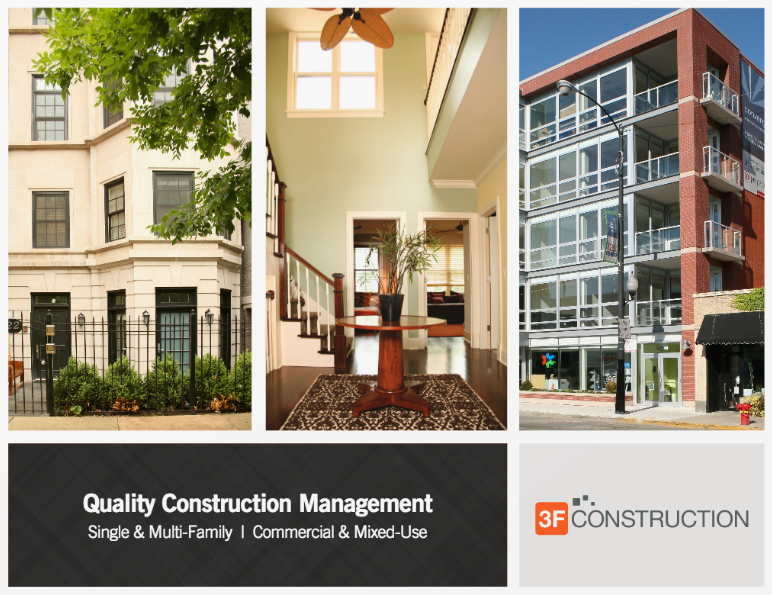 3F Construction is a Chicago based General Contractor founded by developers of multifamily and commercial real estate, 3F disrupts the traditional contractor-owner relationship. But everyone says that, right? So how is 3F different? We don’t just price the drawings and offer typical value engineering options: pick cheaper tile, cabinets, plumbing fixtures, and appliances. How many times have you heard that? Why not reconfigure the kitchen to minimize the cost of plumbing (behind the walls) and eliminate an unnecessary cabinet so you can afford upgraded appliances and plumbing fixtures. Why not procure cabinets directly from China and assemble them on site to avoid unnecessary markup from distributors and handlers. 3F thinks like a real estate developer and that attitude and experience is present in how we do business. That is how we are different and why so many insitutional developers hire us to renovate their properties. 3F was founded by Mike Obloy and Drew Friestedt in 2009 at the depth of the great recession. Our first project was to act as construction manager for the adaptive reuse of a 70 unit apartment building in Chicago’s West Loop. Over the next few years, 3F acquired and renovated over 400 single family homes. We perfected scattered site construction techniques and material procurement. While scaling up the single-family home renovation business we slowly acquired and gut renovated over 75 multifamily buildings in transitional neighborhoods like Pilsen and Humboldt Park in Chicago. Developers took notice and started to contact 3F to renovate their properties. In 2013 we started to perform 3rd party general contracting services for close friends and colleagues. Our experience as real estate developers and general contractors in managing high volume material procurement and scattered site renovations while keeping costs down turned out to be valuable a valuable skill set. 3F figured out a formula to put an institutional “wrapper” around skilled laborers who work from job to job. In order to keep costs down 3F leverages its experience in high volume material procurement, taking a chapter from production home builders. Rather than allow subcontractors to buy materials and mark them up, 3F procures materials directly, using volume discounts, and delivers them to subcontractors. 3F is constantly growing its network of material suppliers and in some cases can purchase directly from the manufacturer. By purchasing materials directly from the manufacturer we avoid distributor and subcontractor markup. With 3F handling material procurement, we are able to hire crews of highly skilled labor to install the materials we deliver. 3F effectively acts as the subcontractor executing the work, bringing together the materials and labor. Why don’t more general contractors use this approach? It’s hard to execute at scale. The 3F Team is made up of experienced real estate developers and builders with decades of experience. We foster a culture of trust and accountability. We empower our team members to think creatively, solve complex problems and recommend solutions that maximize value for our clients. And 3F is committed to providing a work environment that foster’s personal and professional growth. 3F Construction has significant project experience renovating and building Multifamily, Commercial, Mixed-use, and Single Family projects. In addition, 3F specializes in high volume apartment unit renovation programs. If you need to renovate 50 apartment units a month, contact us. Provide a wide range of high-quality construction services. Client Focused: Identity and serve client needs. Honesty & Integrity: The only way to operate a business and run a project is with honesty and integrity. People: Hire the best, most qualified people in the market and give them an opportunity to grow. Technology: Use technology to improve the execution of projects at all levels. Leadership: Lead from the front but don’t be afraid to get your hands dirty. Growth: Focus on growing at a rate that does not impact our ability to provide exceptional service to our Clients. 3F uses the PROCORE® cloud-based construction management software to help increase project efficiency and accountability by providing streamlined project communication and documentation. We are able to manage projects in real time from any web-connected mobile device, tablet, laptop, or desktop. PROCORE® provides 3F the ability to collaborate on projects and view various documents, including submittals, RFIs, contracts, schedules, and drawings. This process ensures synchronization between contractors, architects, engineers, and the construction management team. Project data from each job is made visible to owners, offering transparency and accountability for the team. What Is Procore Construction Software?